The followings are the types of playback that can be performed by this unit. Plays back the recorded videos. The scenes marked while recording the video and the scoring scenes recorded in the game recording mode (by using the smartphone application) can be searched. 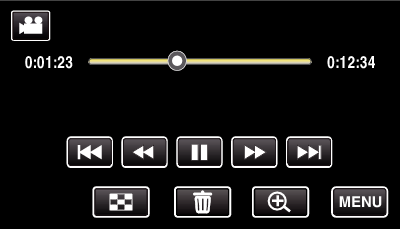 To start, tap “MARK PLAY” on the playback screen. For the game recording mode, refer to the game score settings. From the recorded video, scenes are extracted automatically, pieced together for a digest playback within the specified length. Start playback from “DIGEST PLAYBACK” in the “PLAYBACK SETTING” menu. Videos with defective management information can be played back. Start playback from “PLAYBACK OTHER FILE” in the “PLAYBACK SETTING” menu. 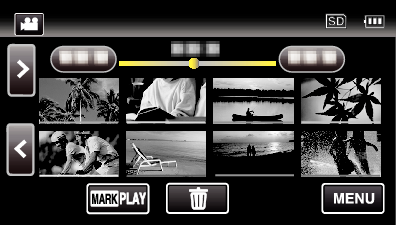 If the mode is still image, tap on the playback screen to display the mode switching screen. Make a backup of important recorded data. It is recommended to copy your important recorded data to a DVD or other recording media for storage. - We shall not be held responsible for loss of recorded contents when recording videos/audio or playback cannot be operated due to malfunctions in this unit, provided parts, or SD card. - Once deleted, recorded contents (data), including data loss due to malfunctions in this unit, cannot be restored. Please be forewarned. - JVC will not be responsible for any lost data. - In order for quality improvement, defective recording medium is subject to be analyzed. Therefore, it may not be returned. Tap to exit the menu. You can display the recording date and duration of the selected file. 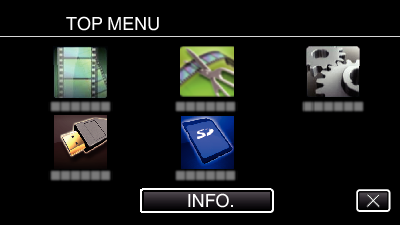 The screen is a display when “VIDEO REC FORMAT” is set to “AVCHD”. “FILE” and “FOLDER” are added when “VIDEO REC FORMAT” is set to “MP4/MOV”. 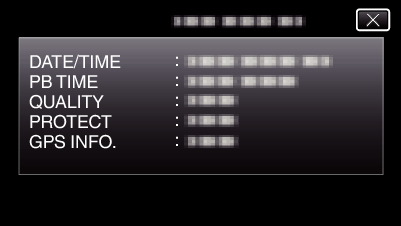 “FILE”, “FOLDER”, “DATE/TIME”, “SIZE”, “PROTECT” and “GPS INFO.” are displayed in still image mode.